I guess that must be your handwriting, that I found on a plastic envelope containing EtBr stained agarose-gels. 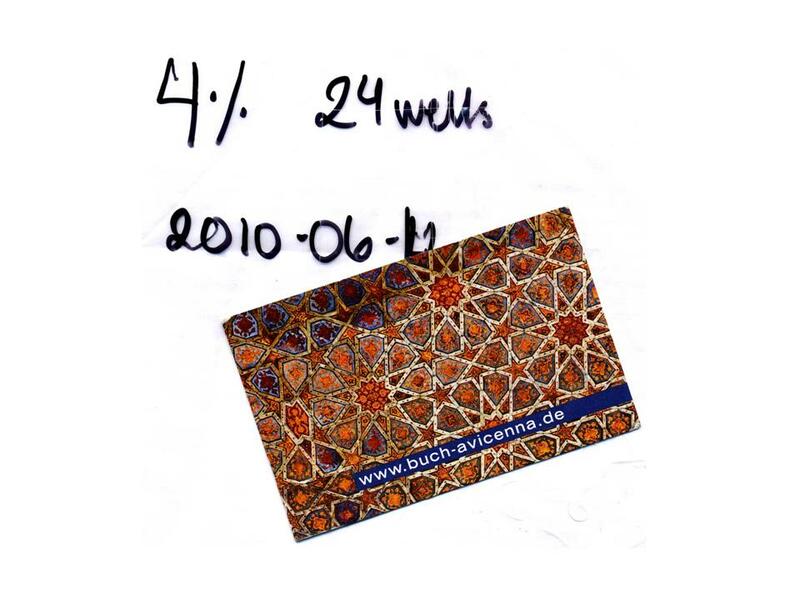 I asked a friend at the Avicenna Bookstore here in Munich, to translate it into Persian, and she proposed that “24 wells” is ” 24 خوب “. If the date is right, than they were lying in the cool-room since two and half years. I thought to give them a trial electrophoresis with some fresh DNA samples we had for sequencing. And what a miracle: they are still giving excellent DNA patters. It must be your angel fingers while casting the gels that made them last forever. Yes this is my handwriting! So the gels are still there? Your friends translation was a bit misleading. She obviously just used a dictonary. “well” is “khob – خوب” yes its correct. but in english well is good and also what we use it in gels (like a slot or a hole. so “khob” means “good”, but not “hole”. Don’t forget, Persia was once leading in Mathematics, with men such as Al-Khwarizmi or Omar Khayyam. If you want to practise more, you can go here.